Throngs of believers flung themselves at a historic statue of Jesus Christ as it inched through Manila on Wednesday for an annual procession that is one of the world’s biggest shows of Catholic zeal. Many in the heaving crowd of men and women, which police said numbered at least 800,000, believe touching the Black Nazarene or being in its presence can heal the sick or grant good fortune. Quiapo church officials said the number joining the procession–called the Traslacion–was much lower than last year’s record 1.2 million. 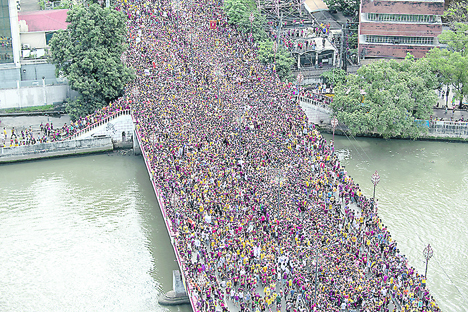 Devotees massed before dawn to catch a glimpse of the statue as it was wheeled on a metal float along a seven-kilometer route through Manila’s narrow streets. Around him people chanted “Viva Nazareno” (Long live Nazarene), cheered and jostled for a glimpse of, or selfie with, the statue cloaked in a maroon robe that is topped with a crown of thorns and cross. Hours into the procession the police and the Red Cross reported more than 500 injuries including cuts and dizziness. Every year hundreds are hurt and a few deaths are not unusual. In 2016, two devotees died while hundreds of others were hurt or collapsed before and during the Traslacion. Metro Manila police chief Guillermo Eleazar said many of the injuries came when devotees tried to jump onto the carriage carrying the image of the Black Nazarene. Critics say the procession, which usually takes about 20 hours, is a mish-mash of superstition and unnecessary risk for the people who flock to it each year. But Church officials say the practice is a vibrant expression of faith in a nation of 105 million that is overwhelmingly Christian. “If you are an outsider, you will not hear, see or feel that faith. You will only see a very unruly or chaotic situation,” said Fr. Danichi Hui, a priest at the procession’s destination, Quiapo church. Church officials say the procession re-enacts the image’s transfer in 1787 to the Minor Basilica from its original shrine inside Intramuros. Despite Manila Mayor Joseph Estrada’s appeal to devotees to avoid throwing their trash on the streets, many dumped plastic bottles and bags with urine on the roads. Task Force Manila Cleanup said they have collected 10 truckloads of garbage along the 6.2-kilometer route from Quirino Grandstand to the Minor Basilica of the Quiapo Church. Street sweepers from the Manila City Hall’s Department of Public Sanitation and the Metro Manila Development Authority followed behind the throng of devotees to collect the piles of trash mostly plastic water bottles, styrofoam food containers, and utensils, plastic cups, cigarette butts, wrappers, plastic bags, newspapers and carton boxes. By early evening, the Nazareno’s carriage was still inching its way back to the Quiapo church and was expected to arrive much earlier than it did last year when the procession took a grueling 22 hours to complete. Eleazar said mobile phone signals, which were jammed for security purposes, would be restored after the crowd dispersed. He also said the cancellation of classes in Manila and Quezon City helped decongest traffic in the areas of Quiapo, Sta. Cruz and Binondo. Manila Archbishop Luis Antonio Cardinal Tagle defended the devotees of the Black Nazarene from being tagged as “fanatics” in his homily during the midnight mass for the Feast of the Black Nazarene, saying it was love that drives them to have faith. “It seems that people question every year whether being a devotee is right or important. There is even a word they often use: isn’t that fanaticism? But if they’re the same, why is there the word ‘devotee’? Devotee loves, while a fanatic just clings on something that gives them value,” the Cardinal said in a Mass held at the Quirino Grandstand on Wednesday. “A real devotee loves. The essence of devotion is love. Piety is embracing God and others with true love,” Tagle said in his homily. “But only devotees will understand it. If you’re not a devotee you’re going to question it,” he added.